Minimize eyestrain and reduce clutter. Is there a better alternative to Peek? Is Peek really the best app in Desktop category? Will Peek work good on macOS 10.13.4? Peek is intended for users who have sensitive eyes and need to reduce clutter around what they are reading on the computer display. 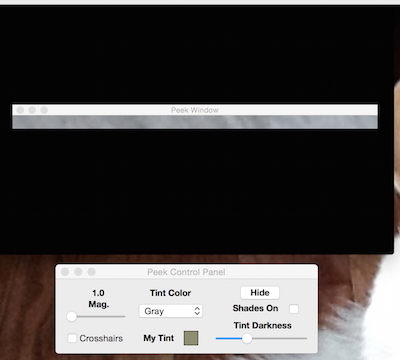 Peek is compatible with normal and Retina displays. Peek is freeware. Peek needs a review. Be the first to review this app and get the discussion started! Peek needs a rating. Be the first to rate this app and get the discussion started!